The British Columbia Hockey League is a Junior A ice hockey league from British Columbia under Hockey Canada, a subsection of the Canadian Junior Hockey League. BCHL now includes 17 teams. These teams play in three divisions, known as the Interior, Island and Mainland divisions. Whether you are looking for a place to conduct a meeting, or the perfect spot for a family gathering, we have a great selection of facilities available to choose from. 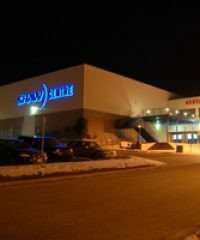 The Frank Crane Arena is a 3,000-seat multi-purpose arena in Nanaimo, British Columbia. It is home to the Nanaimo Clippers of the British Columbia Hockey League.